Have any of you had luck in decoding the .BOP or .FOL files in SOTHR? I'm assuming .BOP is where the sprite data is being held, but as these file extentions seemed to have been created before we discovered trees, I have no way with working with them. Olly do you still have contact details for Jeff Gamon? He could mostlikely shed some light on it, if not he could get us in contact with Steve Leney who would know. If I can get into these files, I can use them to effectively recreate and improve most of the SOTHR units, which would save me a hell of a headache drawing these units from scratch. I've had a go at the btb editor, specifically regarding the mages. It's a very slow, trial and error process and honestly I didn't have much luck. A quick fix is to always replace a mage with a mage, the mage will always use spells it is scripted to use though, so if you change the necromancer to a brightmage, if it's scripted to fly then cast death spasm, it will. However the mage will cast other spells seemingly at random, fireball, burning head, etc. Most of the time, this will crash the game. To make progress, you'll have to find what line casts what spell, and alter it to what you need it to be. Needle in a haystack. As for the dev's, I think they are flattered that people still love the game this far on, but their knowlege of the game is in peices, 14 years will do that to you. I've transfered some of the recovered files from my old computer, it will take me time to filter through to see what I can salvage and what I need to re-do again. I'll keep you guys updated on the sprite work. My house was flooded, lost a lot of my stuff and the electric etc was destroyed. I had to move home after that, I got my pc back late on the 8th and came online after the tournament was over. In a word, ragequit. I'm afraid I'd have to agree, judging by the last tournament it could go on for a good few hours, I'd only have two hours to play. I don't want to give much away from the units you will encounter in later chapters, but as it stands I've completed the 4th Nuln Halbardiers and keelers Longbows, I've added a new ranged unit, the imperial marksmen (foot handgunners), as of yet they have Nordland colours (blue/yellow) though I'm tempted to change them to red/white. I'm about halfway finished with Vannheims 75th, the campaign was initially going to be based around their commander Siegfried Vannheim. 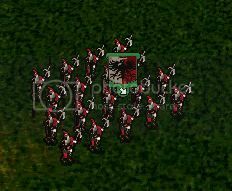 However I figured I'd increase the difficulty by making the commander a footsoldier, so I opted for the Carroburg Greatswords instead, and stopped work on the unit. The new race will not be present until chapter two, so I won't have any information or pictures on them until I'm ready to release the second part of the campaign. Inspired by SOTHR units that didn't make it into Dark Omen, I've began work on an alternative, story driven campaign detailing the exploits of units disbanded by the grudge bringers after SOTHR. The first section of the campaign is set in the greenskin infested outskirts of Bretonnia, you play as Dieter Schaffer, commanding the Carroburg Greatswords. You lead a small, but veteran force of men. Some of which will be old favorites returning from SOTHR, others are new imperial units. As of yet, the first portion of the campaign is 80% complete, I need to finish up the voice acting and overcome portrait errors. Anyone with knowledge or dealings with the in game officer portraits would be extremely useful at this point in time. I will update this thread with information as I have it, or if requested. There's a lot of difference between one mission and the next, for example skipping protecting bogenhafen means you don't get the item the book of ashur, however because you skip it you get to helmgart in time before the undead over run it, so you defend instead of attack. It doesn't have any bearing on the very final mission in the game, but it will cause problems for some of the mini-bosses, like the hand of nagash has more troops if you stop to help the ogres and ragnars wolves (but you get the ogres and ragnars wolves to compensate for that) same with the black grail, if you decide to go off and help the elves you gain archers and the spelleater shield, but you lose the knights of the realm. It's up to you what you want to do, I personally take my time and gather the extra troops. The only way to make the final mission harder is to lose any of the mini quests, eg hand of nagash or the black grail. Which I really would not advise, especially if you skipped getting troops. I like the 3/10 5/15 rulesets, simple easy to follow and seems reasonably balanced. I like fair omen too, though it needs some minor cost adjustments (bright mage, mage items) and some unit tweaking, like the scorpion/dwarfs. Our Dost rules over at ovotech were an attempt at online balance, while keeping the armies true to WHFB, eg wood elves not using fire due to the damage it would cause to their forest. In the end, it became overly confusing to make armies, due to the huge restrictions of each army.